If you've been wondering what 2011 Roush Mustang engineers were going to do with the new Mustang 5.0 coyote engine, you don't have to wait any longer. 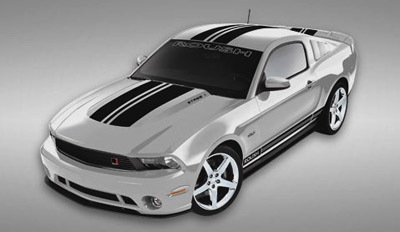 There are four choices for 2011 Roush Mustangs and do they look good! If you Follow Roush Performance vehicles, you'll know that you can get anything from appearance upgrades, to an all out performance supercar. Roush also sells aftermarket upgrades, so that you can transform your 2011 Mustang or other years, into fire breathing road warriors. 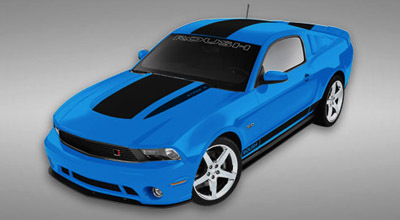 A 2011 Roush Mustang Stage, is all about style and finish. Roush takes the civilized looking new Mustang and gives it teeth. New front fascia, with driving lamps, a dual front splitter, rear bumper fascia, side rocker splitters, and a 3 piece rear wing, reminiscent of say, a 1969 Boss 302. 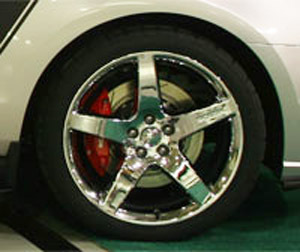 The tires and wheels are upgraded to some tasty chrome 18 inch styled wheels, with high performance Cooper 2XS tires. There's a few more goodies in the interior to let you know this ain't no ordinary 2011 Ford Mustang. You'll find special Roush floor mats, a console badge and a windshield banner. While the engine, is the 5.0 Coyote V8, which produces a not too shabby 412 horsepower, there are no performance upgrades in the stage1 model. 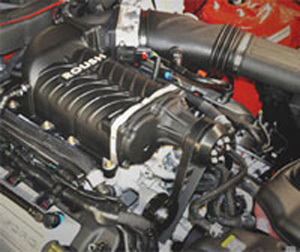 You will find, however, a serialized plaque in the engine compartment, designating the car as a genuine 2011 Roush. There's a long list of options for the stage 1, including such things as 20 inch rims and tires, a Roush exhaust kit, lowering springs and a whole lot more. Roush, well known for it's racing wins and engineering expertise, does amazing things to improve Mustang handling, and the 2011 Mustang is no exception. In the words of the folks at Roush, the 2011 Roush Mustang Stage 2 "is designed to turn that daily commute into a slalom course". Roush isn't big on details, but you can get a pretty good idea what's under hood and under the car in the suspension department in the following Roush Mustang video. (the burnout's not bad either). There are a lot more sports and performance upgrades available in a Stage 2 Roush, including a big brake upgrade and a sport brake package, a short throw shift kit and more. Not only will you look good, you'll be cornering like a go-kart. Although it's a 2010 Roush 427R, here's a cool video of a supercharged Roush Mustang. They're gonna need a new set of tires after this ! The 2011 Roush Mustang 5XR (seen at the top of the page) is Roush's all out extreme performer and handler. While other tuners are good at either handling, styling or performance, these folks know what works in all departments and the 5XR is the proof. Outfitted with the standard exterior Roush goodies, the 5XR also features distinctive striping and identification. 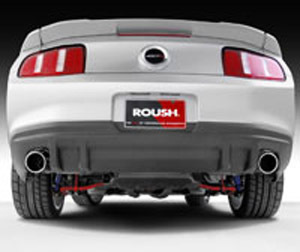 The 5XR Roush Mustang includes the go-kart like handling upgrades from the Stage 2 Mustang. Just the thing for the huge increase in power from the already powerful 5.0 Mustang Coyote engine. Everyone has been wondering just what the folks at Roush were going to do with that brand new Coyote engine. Could they improve this one, the way they had with the old 4.6 liter V8? Well, fear not, this new V8 is a screamer. With a total of 525 horsepower lurking under the hood and a big block like, 465 pounds of torque, Mr Shelby just might take note! This is a really complete package, so the extras are fewer. But they include some cool stuff, like leather seats, illuminated sill plates, a billet grille, rear quarter window louvers and a boost gauge pod. Roush has decided to manufacture only 150 of these beauties, in either coupe or convertible form, so if you want one, you'd better hurry. If you don't have the coin for the big buck supercharger Roush, you can still have all the looks at a much lower price. 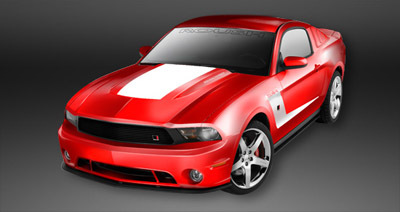 Check out the 2011 Roush Sport package which is available through select Ford dealers.